Walking up to the community ofrenda, Sandra McEwan slides the old picture of her grandpa from her folder to add to the altar. The tangible memory of him is placed on the second level of the ofrenda, which sits on Industrial Street during Denton’s seventh annual Day of the Dead Festival. As music and chatter surround McEwan and her sister Denise Draper, they connect to their memories of their grandpa Pacheco. They remember what he meant to them as tears fill their eyes. It is the spirit of Day of the Dead, known in Mexico as Día de los Muertos, to take a moment to remember loved ones who have passed away. For McEwan and Draper, its representation in the festival is important and helps connect them to their grandpa and the Hispanic heritage they have through him. “We actually felt like because he is our Hispanic ancestor and the most Hispanic person in our lives it was appropriate to bring his picture here,” Draper said. 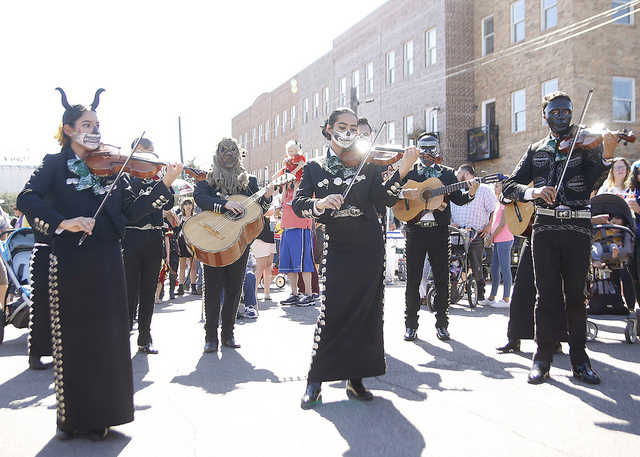 For most, streets filled with Halloween costumes and the coffin race come to mind when they think of Denton’s Day of the Dead Festival. But honoring the event’s namesake has always been a big focus of the day as well. It all started in 2009 when David Pierce composed a family-friendly Halloween musical performance called Cirque du Horror, which had a great response and made him realize the need for a fall-themed festival in Denton. When Pierce looked at the culture of Denton, he saw an all-encompassing music and art scene representing different styles. When he thought of fall he pictured the harvest, Halloween and Día de los Muertos. “I thought, ‘That would be so amazing to me because this is how I see Denton if we could fuse multiple elements of fall and celebrate each component,’” Pierce said. He put together the first Day of the Dead Festival in 2011 and it has been around ever since. Even though the festival does represent different parts of the fall season, Pierce named it “Day of the Dead” because of his own connection with the holiday. “I thought at the time if you called it ‘Day of the Dead Festival,’ you would have sort of like a tongue-in-cheek play toward Halloween being the ‘dead’ element, but then also to call it ‘Day of the Dead’ to let people know we were trying to also focus on Día de los Muertos,” Pierce said. Pierce said he knows there has been some backlash about the name and talk of cultural appropriation. He said he understands this side of the story but also hopes people understand he is aware of the meaning of the holiday to the Hispanic community because of his own heritage. Every year Pierce and his team work to build on this part of the festival so people can see they are trying to pay a respectful tribute to what the holiday is actually about. One of the ways the festival focused on honoring the heritage of Día de los Muertos was by creating the community ofrenda for the first time. “Essentially it’s a community altar where anyone in the community who has lost a loved one and wants to remember them can, by bringing a picture or something that reminds them of them,” said Laura Gonzalez, builder of the ofrenda and co-chair of the Twilight Lantern Parade. 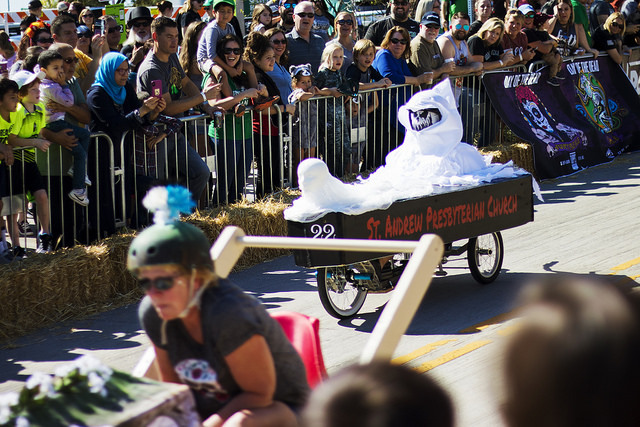 Gonzalez has been creating tangible Día de los Muertos components of the festival since 2014. Although Gonzalez is of Mexican descent, she never celebrated Día de los Muertos growing up. 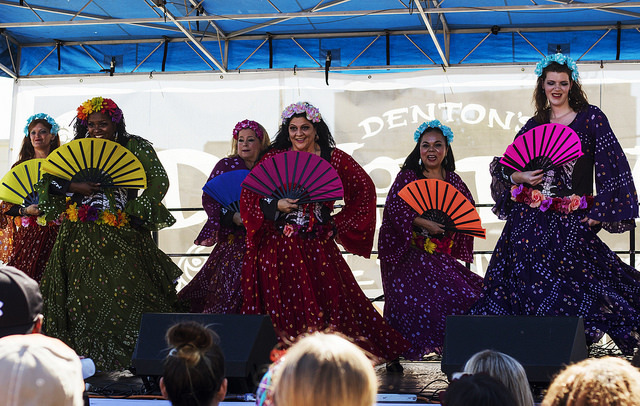 It was not until she got involved in the festival that she learned about the traditions and how it connected to her Mexican heritage. Prosper resident Florencia Sanders grew up in Mexico and had made ofrendas there when she was younger. Now, standing in front of the Day of the Dead Festival’s altar she enjoyed every detail. This was the first time Sanders and her family came to the festival. Although she has her own altar at home to celebrate the holiday, she said it was special to see her culture’s holiday represented. Sisters Lauren and Taylor Gallegos stopped by the altar wearing dresses and their faces painted like skeletons. The festival is something they have been coming to for the past few years. 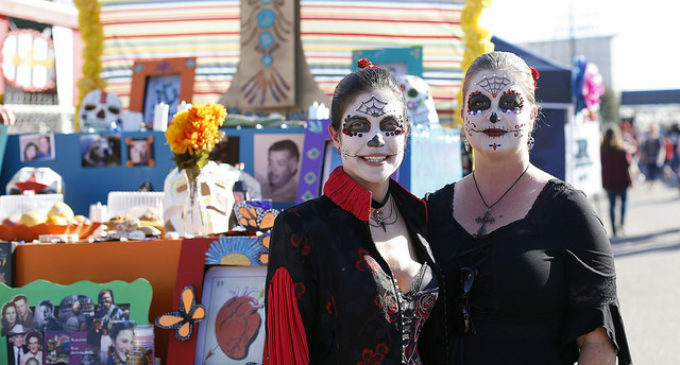 “We’re Hispanic so we definitely love Day of the Dead and everything that it represents because in Hispanic culture, death isn’t a terrible thing — it’s a celebration of life,” Lauren said. Jesus Chacon and Luz Escobar see the Day of the Dead Festival as a mix of their Mexican traditions and their future American traditions. They are from Yucatán, Mexico, but their baby daughter is American. Coming to the Day of the Dead Festival is a way for them to mix their traditions with new memories. 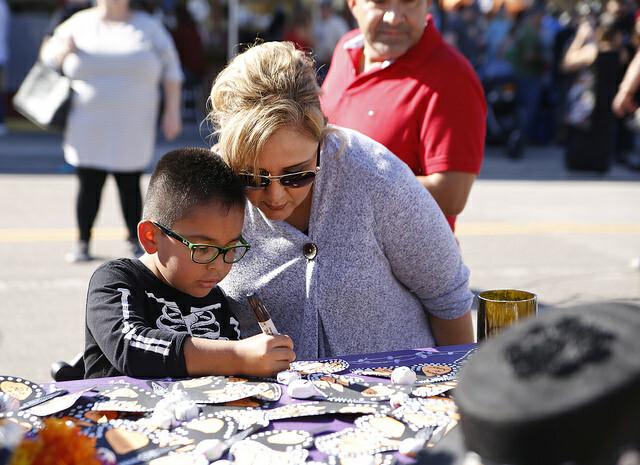 It has been the spirit of the Day of the Dead Festival since Pierce created it seven years ago to represent the different cultures and aspects of fall so everyone in Denton can come together as a community.